The year 2012 will not go down as the proudest for the Scottish national team, but it ended with a victory. A narrow one, but a victory nonetheless. So what did we learn from the game against Luxembourg? Well, on the evidence of the first half at least, we know that Kenny Miller and Jordan Rhodes make a pretty potent striking partnership. While Rhodes grabbed the goals, it was Miller who particularly impressed as he dropped deep to pick up possession before linking well with his fellow striker or Steven Naismith. The return of Steven Fletcher to the Scotland set-up for the last two World Cup qualifiers seemed to have signalled the beginning of the end of Miller's international career, but his performance in at the Stade Josy Barthel suggests he still has something to offer the national team. His pairing with Rhodes also hints at what might have been if Scotland had played with two up front when it actually mattered. Of course, any successes from this match have to be qualified by the fact they were achieved against a country ranked 144th in the world. But, without question, Scotland played with a verve and positivity during the first half that had been absent for the most part in the World Cup qualifiers. There were also international debuts for Andrew Shinnie and Liam Kelly [Leigh Griffiths and Murray Davidson too, but neither had sufficient time to allow for a reasonable assessment]. Shinnie played for over an hour and Kelly had the second half and, truth be told, neither made serious claims for a regular place in the full squad in the near future. Stark also handed Matt Gilks and Grant Hanley opportunities to show their capabilities, but again there was little to suggest they can be anything more than squad players when it comes to future qualifiers. The same cannot be said for Charlie Mulgrew, who in the first half looked entirely comfortable in a central midfield role, again showing his versatility, and surely he has many more caps to come. 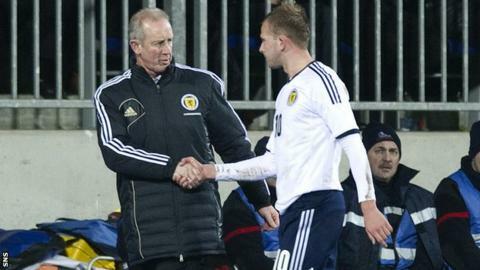 It was perhaps no coincidence that Scotland lost a grip on the game following his departure at half-time. And it was in that second period that it was underlined why significant concern remains about this Scotland team. The early goal scored by Luxembourg seemed to drain any confidence that had built up as a result of the impressive first-half performance. Suddenly, Scotland were being dominated by a team largely made up of part-time players and if the hosts had equalised, it would have been difficult to argue they had not deserved it. All of the early positivity in the Scottish ranks vanished as they were pinned back in their own half. So what does the performance as a whole say about Billy Stark's chances of succeeding Craig Levein on a permanent basis? If the Scots had continued in the same vein in the second half, maybe adding another couple of goals, the interim manager might well have found himself with significant support. But they didn't and so Stark remains an outside bet for the post. He may be given the friendly against Estonia in February if the Scottish Football Association cannot decide on a permanent successor to Levein by then. However, Stark - a hugely likeable character - does not have the 'wow' factor the SFA need to reignite the enthusiasm of the country for the national team and somehow turn a team of under-achievers into achievers. You can follow Al Lamont on Twitter.